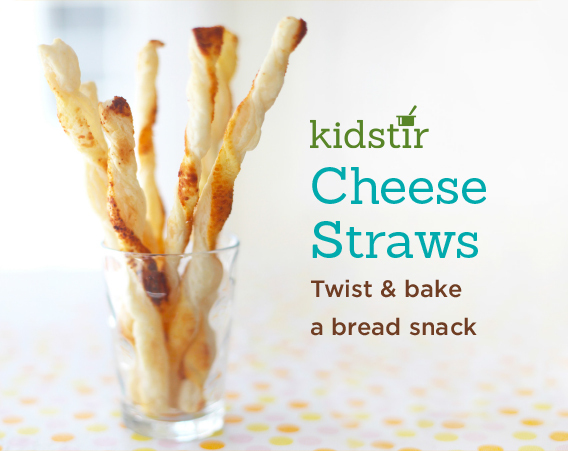 The next time you go to the grocery store, pick up some puff pastry and let your kids play with real dough to make these bread twists. Look for all natural puff pastry in the freezer section. We seasoned the sticks with parmesan cheese, but you can also add dried or fresh herbs. 1. Preheat the oven to 375*. Use a rolling pin to roll out the puff pastry on a lightly floured countertop or cutting board. It should be around 10 x 12 inches. 2. Whisk the egg with 1 tablespoon of water. Brush it all over the pastry. 3. Sprinkle the parmesan cheese, salt, herbs, and pepper over the pastry. With the rolling pin, lightly press the cheese into the puff pastry. 4. Cut each sheet widthwise with a pizza wheel into a dozen strips. Twist each strip and lay on a baking sheet lined with parchment paper. 5. Bake for 12 to 15 minutes or until light brown and puffed up.